Mike Splane, one of my regular readers and the inspiration for countless posts on this blog, has often asked why I often identify my younger opponents as, “John Doe, the #17 14-year-old in the country.” Why don’t I refer to older players like him the same way? Well, there are three reasons. It recognizes the accomplishments of these kids, and subtly advertises how great the chess scene in the Bay Area is to produce such accomplished kids. The information is available. The USCF has a list of top 100 players for every age up through 18. Mike Splane, the #1 65-year-old in the country! Let me just say that I think it is amazing to be #1 in the country on ANY list or sub-list, so congratulations to Mike! Here is an honor roll of the top US players over 65, by age group, as of March 2019. There is no one of age 79 on the top-100 list, so I can’t tell you who is the #1 79-year-old. To celebrate Mike’s 1000 games and his promotion to #1, I’d like to show you what he calls his best game so far this year. I have to agree, it’s a cool game. It’s especially interesting, in view of my recent post on Long Marches (voluntary transfers of the king from one side of the board to the other) that this game features a Semi-Long March (or Short March?) where Mike marches his king to e4, which turns out to be the safest place for him! Mike decided to try a plan where he refrains from playing e2-e4. A nice thing about this plan is that it leaves the e4 square available for his pieces. Also, it makes the position a little bit different from what his opponent is used to. Jesse Kraai used to call King’s Indian players “trained monkeys,” because they only know how to do one thing – push their pawns to e5, f4, g4, etc. But that may not be best in this position. Position after 12. … f5. White to move. This is an interesting case of the Mike Splane Question: How am I going to win this game? Mike says, by placing a knight on e6. Objectively speaking, that should not win the game, as I will explain below. Nevertheless, as I have said many times, the Mike Splane Question gives you a destination to aim for, and it is amazing how often your intuition will turn out to be right! An interesting maneuver. Mike is really aiming for h6, but he plays this move first in order to enable the knight to follow the bishop to g5. 13. … Qe8 14. Bh6 f4?! Black commits a failure of imagination. He only knows one plan, and he doesn’t stop and think how the position is different without a White pawn on e4. Thus, he fails to realize that … f4 will hand over the beautiful square e4 to White’s pieces. He also fails to realize the latent power of White’s bishop on g2, or to grasp the importance of blocking that bishop’s diagonal while simultaneously unleashing his own bishop on g7. For all these reasons, I consider 14. … e4! to be the most powerful, principled move and the way to really query whether White has ceded too much control over the center. Note that White’s plan of playing Ng5 is ruined, and also 15. Bxg7? is bad because of 15. … ef! 16. Bxf8 fg! Of course White can play 15. Nd4, but after 15. … Qe5 we get to a position I would love to play as Black. 15. Bxg7 Nxg7 16. Ng5 Nc5? Position after 16. … Nc5. White to move. “A good move,” writes Mike. I disagree. It was a bad move, because Black got his move order wrong. He should have played 16. … h6 first. Mike writes, “I thought I was clearly better after 16. … h6 17. Ne6 Nxe6 18. de Bxe6 19 Bxb7 …” and I’ll skip the rest of the analysis because Mike has gone off the rails After 16. … h6! 17. Ne6? Nxe6 (by the way, Rybka actually prefers 17. 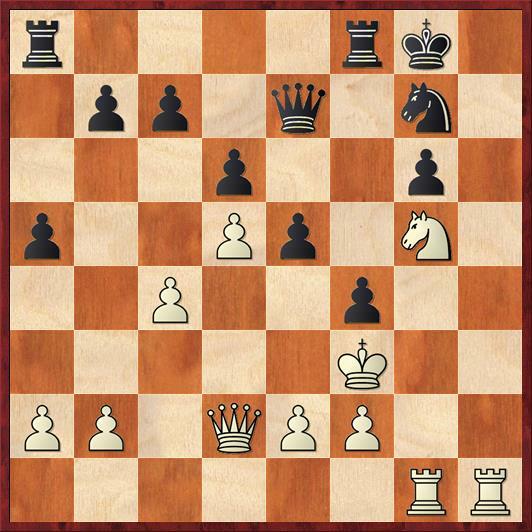 … Bxe6, but this is a somewhat non-human move) 18. de Nc5! White is very hard pressed to justify the forced loss of the e6 pawn. 19. e7 Qxe7 20 Nd5 Qf7 gives him nothing. The Black queen and king look vulnerable but there is no way for White to magically sink his bishop on d5. Likewise, 19. Nd5 Nxe6 gives White nothing. The only thing I could come up with here was a crazy, far-out piece sac with 20. Nxc7 Nxc7 21. Qxd6. This is indeed awkward for Black, until you realize that Black can comfortably give away a second pawn for the piece and still be in the driver’s seat. I like the crazy idea 21. … Rf7! 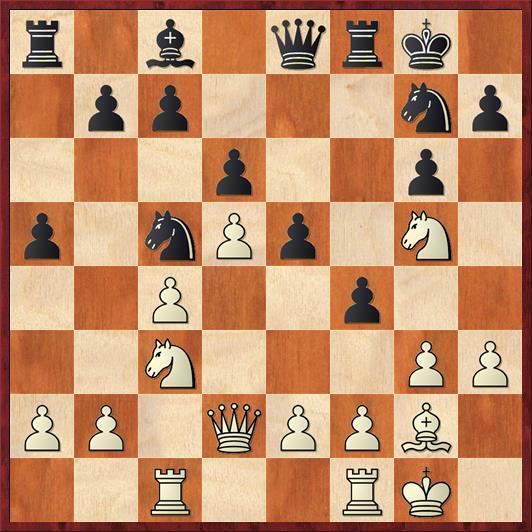 ?, with the point that if White tries to win a third pawn for the piece with 22. Qxg6+ Rg7 23. Qxh6, his queen gets trapped in highly unusual fashion with with 23. … Ra6 24. Qh4 (forced) Rh7 25. Qg5+ (forced) Rg6! But this is all fantasy chess. The point is that the pawn sac with 17. Ne6 just doesn’t work. However, White still has a small but solid advantage after 16. … h6 17. Nge4. Rybka says it’s +0.4 for White. From here on, though, I have nothing but praise for Mike’s play and nothing but agreement with his annotations. “The best move of the game,” Mike writes. Well, I love 29. Ke4, too, but this is certainly deeper. “The plan if he remains passive is exactly what I played in the game, Bf3, Kg2, Rh1, and push the h-pawn.” But what’s really great about 17. g4 is that it’s a pawn sacrifice, and it’s concealed so that Black actually thinks that he’s winning a pawn. I think that Mike is good at these psychological tricks. I’ve written before about his theory that people tend to underrate “forced moves” by their opponent, thinking that if the move was forced it can’t be dangerous. People also tend to overrate winning material if it seems to be won through their own cleverness. Mike felt that if Black takes the bait and wins a pawn, White will have Benko-like compensation because the g- and h-files will be open for his rooks. The game proves him to be totally right. The bait attracts a nibble! Black wins a pawn. All part of White’s master plan. Mike’s first deviation from the plan, and I like it! The king gets out of the way of both rooks. White’s attack is too sudden for Black to take advantage of White’s king being in the center. Maybe he has some thoughts of running, but Mike’s next move puts the kibosh on that. Position after 26. … Kg8. White to move. If Black goes back to home base with 26. … Ke8, then 27. Rh7 followed by 28. Ne6 (remember the Mike Splane Question!) is overwhelming. All I can say is, bravo! Move order is critical! It was still possible for White to screw up with 28. Ke4?? Ng3+! 29. fg Qg5 30. gf Qf4 mate! This is the sort of thing you would usually expect when moving your king to e4. It’s impressive that Mike saw this line but was still confident enough to move his king to e4 one move later. “I don’t know if you can give a 3-move maneuver an exclamation mark,” Mike writes. Yes you can, I reply. You give an exclamation mark to each move. Mike says he completely missed this idea. Well, of course Black is trying to set up some kind of mating net, along the lines of what we saw in the previous note. But this move ends up making absolutely zero difference to the outcome of the game. 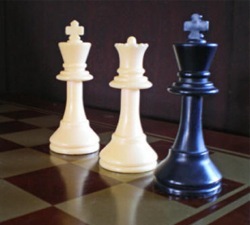 Beautiful and original chess. Yes, ma, there is still life after 64! Congratulations to Mike Splane for his #1 ranking! Of course, there is a certain amount of luck in being #1 for a particular age, as it is in part dependent upon when the stork arrived so many years ago. Looking ahead for me, at my current age of 63, I will be forever (well, figuratively) be contending with the likes of the aforementioned Jay Bonin, Bruce Wall, and others, players who are rated considerably higher than I am. And so I would point out that even more impressive is that Mike is rated #21 in the country for people 65 and over! Think of that: only 20 people in the entire country are rated higher than he is for that demographic. This was a very creative game, suckering Black into opening up the kingside lines. 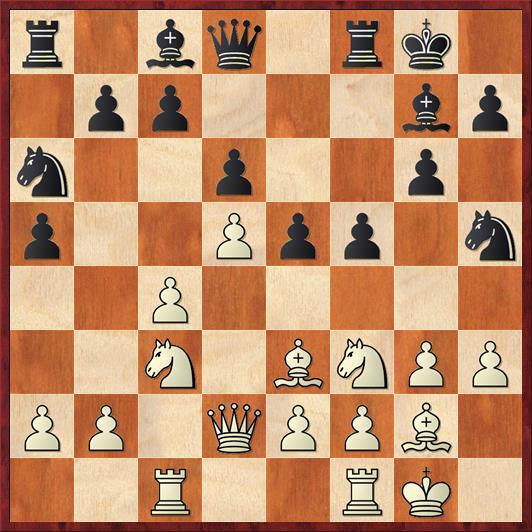 However, while it is very desirable to keep a White knight out of e6 via … h6, how exactly can Black effect that move with the White Qd2 and Be3 preventing that pawn advance? Just this last Monday I tried that very idea with Black, playing … h6 and … Kh7 supporting the pawn. White changed course and played e4 (no bishop yet on e3), so when I finally got to the promised land with … f5, White played exf5! and not all was milk and honey for me as Black. Next post: OMG! I Played Capablanca’s Move!